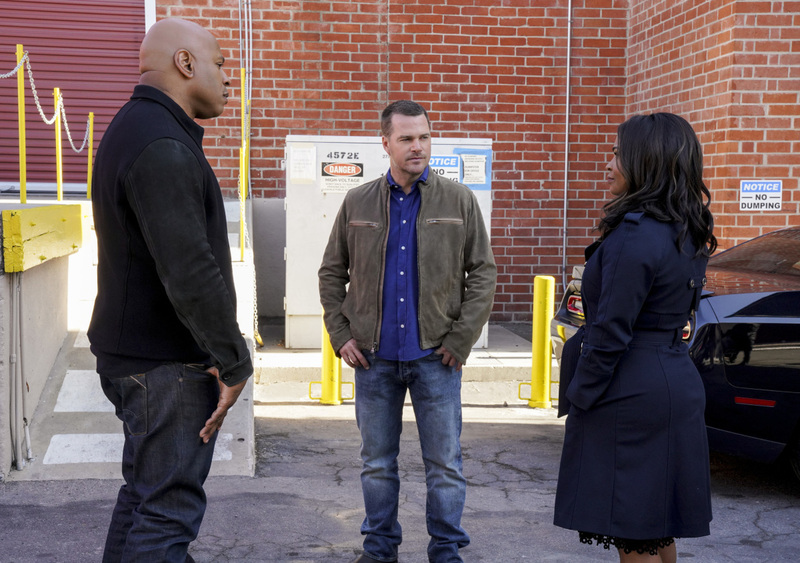 Preview images and guest cast for the NCIS: Los Angeles episode "Where Everybody Knows Your Name"
NCIS partners with the FBI after a Marine is murdered by a rare nerve gas. Also, Deeks shares his dream to quit law enforcement and open a bar, on NCIS: LOS ANGELES, Sunday, May 6 (9:00-10:00 PM, ET/PT) on the CBS Television Network. "Where Everybody Knows Your Name" - Pictured: LL COOL J (Special Agent Sam Hanna), Chris O'Donnell (Special Agent G. Callen) and Nia Long (Executive Assistant Director Shay Mosley). NCIS partners with the FBI after a Marine is murdered by a rare nerve gas. Also, Deeks shares his dream to quit law enforcement and open a bar, on NCIS: LOS ANGELES, Sunday, May 6 (9:00-10:00 PM, ET/PT) on the CBS Television Network. Photo: Bill Inoshita/CBS ÃÂ©2018 CBS Broadcasting, Inc. All Rights Reserved. Recurring guest stars in the episode include Andrea Bordeaux as NCIS Special Agent Harley Hidoko. Additional guest stars include Erin Way (FBI Agent Zoe Morris), Adam Chambers (Victor), Wiley Pickett (FBI Special Agent Fred Munger), Tyler Poelle (Corey), Jocelyn Ayanna (Angie), Emanuel Borria (Gus), Anastasia Leddick (Amanda), Melody Butiu (Evie), and Duncan Campbell (NCIS Special Agent Castor).